The dogs and I spent the morning walking the trails and geocaching in Lake Fausse Pointe State Park where we camped last night. We completed two loop trails for a total of 2.35 miles through the woods. In the process we found five caches! One trail, Cardinal Run, was aptly named. Cardinals were everywhere! Too bad I was only carrying my point and shoot camera…close up shots eluded me. 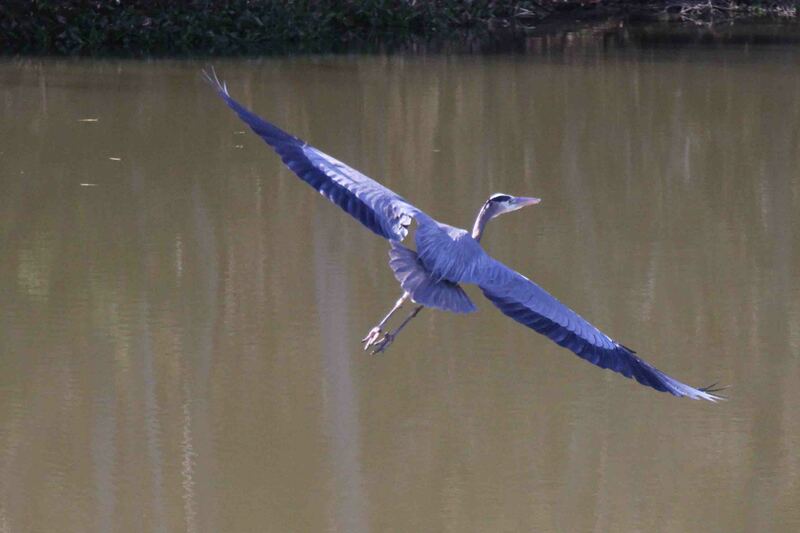 Upon returning to VANilla, I was able to grab the zoom lens and snap a few good shots of a great blue heron. After a lovely, though slightly nippy morning outside, we took the levee road north to Henderson, our next stop on the Louisiana Bayou Byway, where jet boat tours of Atchafalaya Basin leave from McGee’s Landing. I pulled off at Pat’s Restaurant to look at a map and get my bearings when a former client Max called. This area of Louisiana used to be her stomping grounds. She knew exactly where I was, told me to have lunch at Pat’s, check out the dance hall at Whiskey River Landing, and go on the swamp tour. The crawfish etouffee at Pat’s was excellent. The Cowboys were playing at the same time the Saints were playing, so I settled for Saints football over lunch. I returned south about a mile and turned on a gravel road cut over the levee to find Whiskey River Landing on the other side. I would have never known it was there! The Cajun music and dancing didn’t start until 4 on Sundays, so I drove a half mile further down the levee to McGee’s to check on the swamp tours. I just missed the one o’clock tour and no one was signed up for the three o’clock tour, so it wasn’t going to launch unless I paid the price of five people. I decided to listen to the Cajun band and walk the dogs around instead. These were our last stops on the Louisiana Bayou Byway before the dogs and I to our home state, Texas. Max’s parents, Pat and Gerald, put us up for the night in Groves, Texas. Pat is a big football fan, so we enjoyed an evening of chatting and Sunday night football. Pat and Gerald have been married over fifty years, have four children, seven grandchildren, one great grandchild, and a boxer named Harley.